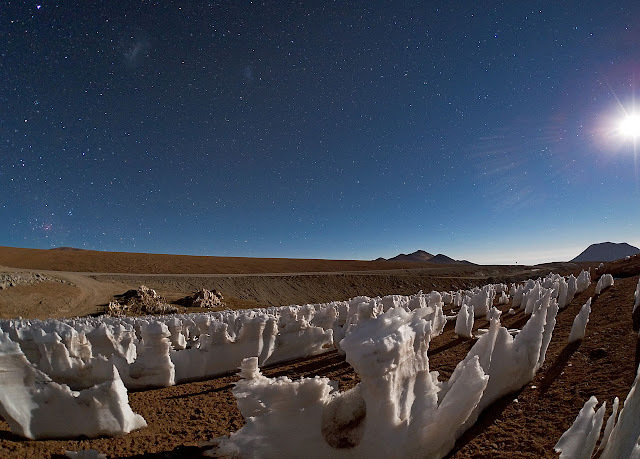 After watching Patricio Guzmán's Nostalgia for the Light, I read a little about the Atacama desert, and came across this picture of penitentes on the Chajnantor plateau. The precise details of the mechanism that forms the penitentes are still not completely understood. For many years, people of the Andes believed [them] to be the result of strong winds prevalent in the mountains. However, the strong winds have only a limited role in shaping these icy pinnacles. Nowadays, it is believed that they are the product of a combination of physical phenomena. The process begins with sunlight shining on the surface of the snow. Due to the very dry conditions in these desert regions, the ice sublimes rather than melts — it goes from solid to gas without melting and passing through a liquid water phase. Surface depressions in the snow trap reflected light, leading to more sublimation and deeper troughs. Within these troughs, increased temperature and humidity means that melting can occur. This positive feedback accelerates the growth of the characteristic structure of the penitentes. The name penitentes comes from a culture with a heavy emphasis on guilt and punishment. This seems out of keeping with a place so remote from humans. It would be nice to have another name and, while I don't believe in angels either except as figments of the human imagination, I'd rather call them angels. They remind me little of Paul Klee's In Engleshut, where the several overlapping forms suggest a variety of possibilities, not all of them bad (and not, perhaps, as destructive as Walter Benjamin's vision of the Angelus Novus). "...so unexpected a truce, so unilateral a peace"